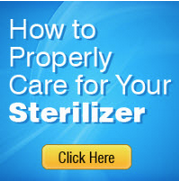 Our new sterilizer is cGMP compliant, Flush Front, and offers more standard features than competing models. 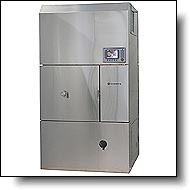 Gruenberg Oven Company designs and manufactures a complete line of standard and custom pharmaceutical sterilizers and depyrogenation ovens. Configurations include laboratory, cabinet, truck-in, pass-through, and continuous arrangements. 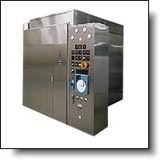 Sterilizers and depyrogenation ovens are designed to reach maximum temperatures up to 280° C. In addition, control systems can be self-sufficient relay logic or PLC, or can be integrated with your process PLC. Side walls and loading tracks are removable for easy clean-up and maintenance.